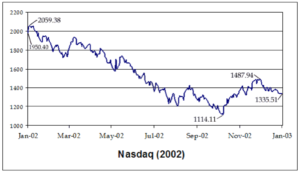 The downturn in the stock market in 2002, also known as stock market crash or internet bubble bursting, saw a drastic drop in stock prices across the US, Canada, Asia and Europe. It can be seen as the culmination of different events that happened right before the crash. The stock market was enjoying a decade long bull run where the Dow rose 15% per year from 1995 to 2000. However, several events started to unravel that led to market corrections. Besides the tragic human loss, the September 11 terrorist attack also had a financial impact closing the New York Stock Exchange for a period of time. 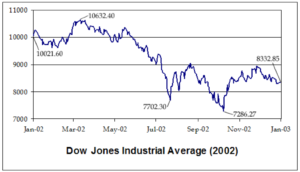 While the markets were able to recover, they began sliding again in March 2002. Following the bursting of the Dot.com bubble, many internet companies declared bankruptcy including WebVan, Exodus, Communications and Pets.com. Companies such as Amazon, eBay and Yahoo! survived the bubble burst but dropped significantly in value. For more info on the Dot.com bubble check out our previous blog here. Accounting scandals from Arthur Andersen, Adelphia, Enron and WorldCom also had a substantial impact on the markets. Investor’s confidence was damaged.